Soil Health Tour – Coalitions & Collaboratives, Inc. Coalitions & Collaboratives, Inc. sponsored a four-day tour in collaboration with Environmental Protection Agency (EPA), Arkansas River Watershed Collaborative, and the Lower Arkansas Valley Water Conservancy District (Lower Ark). 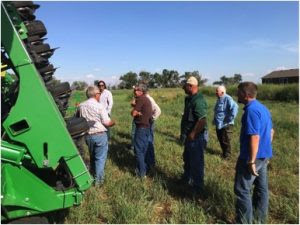 The goal of the tour was to expose agricultural producers from the Lower Arkansas Valley to progressive soil health techniques being utilized by South Dakota producers. 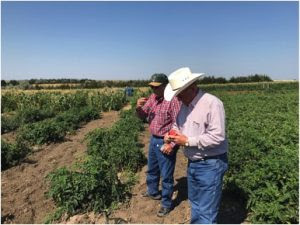 At the Dakota Lakes Research Farm the Colorado producers were introduced to irrigated no-tillage practices with diversified cropping patterns and rotation through lateral sprinkler systems, as well as dry land farming practices through rotational cropping patterns. The tour stressed leaving organic material on the ground, and the producers were discouraged from plowing the land, which aids the natural processes for better soil quality and structure. Dr. Beck discussed that diversified crop rotation helps with weed and insect control stating, “Mother Nature is adaptable and will predict where you are planting and will start to take over that system. 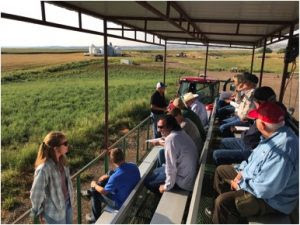 If you rotate crops and go no more than two years with the same crop, you can keep Mother Nature on her toes and out of your field.” This first tour was very eye-opening and thought provoking for the Colorado. Cronin Farms has been a no-till farm for more than 35 years. The Colorado producers toured their fields irrigated well supplied sprinklers as well as their dryland fields. While standing in the middle of the dry land farm cornfield, a couple of the Colorado members noted how the soil felt like standing on a sponge because of all the organic matter. This concept is so effective that it allows the Cronin farm to drive in the middle of the field while it’s wet without getting stuck. This was very intriguing as the Colorado farmers stated they would never enter a saturated field. The Cronin’s have been very progressive in adding cover crops to their rotations. Dan Forgey (Cronin Farm’s manager) stated that the farm rarely sprays for weeds or bugs simply due to the fact of full foliage from the crops and a healthy living system in the soils, as well as a diverse and changing crop rotation, helps to suppress weeds and bugs. Marv Shumacher has a small family farm that is just starting to scratch the surface of no-till and cover crops. The progressive nature of this farm is unique in the fact that there was a recent fire that burnt off an entire wheat field, in Colorado this is a common practice. Mr. Shumacher noted that this was the worst thing that could have happened to his farm because it destroyed his organic matter and hurt his soil health. Before the fire, the no-tillage practices and cover crops were being incorporated for about ten years, and the living system of the soil was thriving. Following the fire, it was noted that the wheat crop suffered by decreasing in production and has yet to recover to pre-fire production rates. This put the idea of burning fields into perspective for the Colorado farmers. Similar to Dan Forgey and Dwayne Beck, Marv Shumacher stressed the importance of diversity, cropping rotation, grazing patterns, keeping the soil intact through health root zones, and minimizing soil disturbance. All of this great education didn’t go unnoticed as the producers from Colorado we’re talking about changes they could make to help their operations better. The next stop on the tour was Rilling Produce, a local drip irrigation producer. 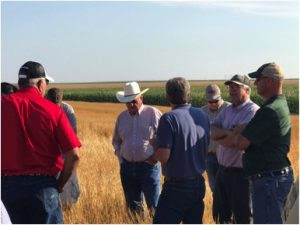 This tour was a little different as soil health was an emphasis, but the idea of no-tillage practices and cover crops were tackled a little differently. Having a drip irrigation system means that the water is concentrated in a single location. This farm had some very evident weed issues which can be correlated to the recent rain showers and had to build an 8-foot fence to keep the animals out. The farm had specialty crops such as melons, peppers, tomatoes, and sweet corn, but lacked cover crops. Mr. Rilling tries to keep a crop in year-round to help with root structure but was still working on improving the soil health just from a different practice. This resonated with the producers from Colorado as it is a similar practice to what is experienced in Colorado. The final visit on the tour was at Jorgensen Land and Cattle with a registered black Angus bull program, 12,000 acres no-till cover crop farm and a guided hunting service. The economic value of no-till farming and grazing was apparent. Although their yields are not as aggressive, their inputs are almost one-third of that of a conventional farmer. The farm focuses on high carbon and nitrogen in the soils to limit the amount of inputs into the crop. Bryan Jorgenson put it this way, “We don’t understand what’s in the soil and that scares people, but it is the most important resource we have as farmers.” While the Colorado producers think of cover-crops having one or two seeds, the Jorgensen’s use six different seeds in their cover crop mix (turnips, lentils, millet, Sudan grass, peas, and oats). To keep their soil healthy, bugs away, and weeds under control, the Jorgensen’s won’t repeat a crop more than two years in a row. This lead to an eye-opening discussion that allowed both Colorado producers and the Jorgensen’s to learn from each other. The Colorado producers explained their tactics of inter seeding cover crops into alfalfa to keep a strong soil structure to get through the winter. Keep the soil covered year round. Avoid disturbance to allow the soil to do what it needs to do. Add diversity and don’t let mother nature predict what is going on. Improve soil cover by adding and leaving residue. Add grazing to let mother nature fertilize itself. The next step is to implement soil health, so agriculture doesn’t “dry up” or “die off” in the Arkansas River basin of Colorado.